More Town Homes provide more options for homeownership to residents who serve the community with the expansion of a successful housing development. For Phase II of the Lincoln Avenue project, 23 three bedroom 1-1/2 bathroom town homes were created in addition to the 14 units originally constructed during Phase I. With the success of the initial development in the New Rochelle center city community, NDR Group planned an expansion to give more young families and municipal workers a chance at affordable homeownership. The $2.5 million project was a partnership between NDR Group and the City of New Rochelle. Like Phase I the site was an urban renewal area. Blighted and deteriorated properties were acquired and the site was cleared for development. The city’s urban renewal efforts made it possible for NDR Group to more forward. The Lincoln Avenue Phase II project was funded in part with grants from the New York State Affordable Housing Corporation, County of Westchester Housing Implementation Fund and Federal HOME Funds. Revitalization of this center city neighborhood was achieved with the completion of Lincoln Avenue Town Houses Phase II. 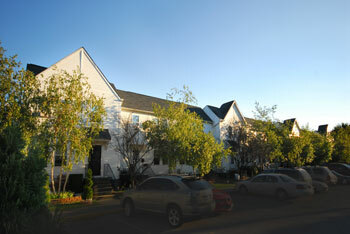 In all 37 new town homes were built in Phase I and Phase II, linking this neighborhood to the downtown and college district. As an initiative to assist those with the greatest needs in affordable housing, NDR Group helps communities go “ Blue”; working with municipal, educational, health, banking and construction industry workers among others, who serve the community. Many of these residents find it difficult to save enough money to purchase a home, but are losing wealth through continually living in a rented property. By having another option such as the Lincoln Avenue Town Houses, workers can feasibly own a home without compromising important components such as a clean and friendly neighborhood. The Lincoln Avenue Town Houses Phase II brought a successful vision to a greater number of families in the community, making a significant impact on the well-being of the residents and overall state of the neighborhood.